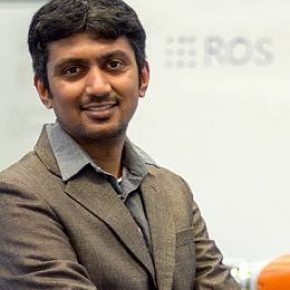 Mukunda is a post-doctoral researcher at the Department of Cognitive Robotics, Delft University of Technology, in the Robot Dynamics Group. He received his Master’s Degree in Embedded Systems and PhD in Robotics from Delft University of Technology in 2011 and 2018 respectively. His current research activities involve the study of effectively combining supervised learning and optimal control for dynamically constrained motion planning with sampling-based planners. He is also a member of the Education Board of the H2020 EU Project ROSIN: ROS-Industrial Quality-Assured Robot Software Components. Mukunda was the Motion planning lead for Team Delft, that won the Amazon Robotics Challenge 2016. Apart from this, he worked on development and integration of multiple ROS-based applications for the EU FP7 project Factory-in-a-Day, that focused on developing modular and collaborative robotic solutions for Small and Medium Scale Industries.